Affect and effect are easy to mix up. Here’s the short version of how to use affect vs. effect. Affect is usually a verb, and it means to impact or change. Effect is usually a noun, an effect is the result of a change. Watch out! There are certain situations and fixed phrases that break the general usage rules for these words. Is it affect or effect? In a nutshell, affect is a verb and effect is a noun. At least (spoiler alert! ), most of the time. In the majority of cases, you’ll encounter the words as these parts of speech. So, if A affects B, B experiences the effect of A’s action. Imagine Ruby (A) pushes Raphael (B) into a pond. Ruby affects where Raphael is standing. Raphael being wet is the effect of Ruby’s irresistible urge to push him into a pond. Because Ruby performed an action, that signals the use of a verb: affect. The result, or effect, of that verb is “wetness,” a noun that is probably causing Raphael a whole lot of discomfort. Affect and effect are different parts of speech, but they sound almost identical. Sound-alike pairs like affect vs. effect are tricky because many people pronounce them as homophones, which means, well, that they sound alike. Bear/bare, here/hear, and write/right are other examples. So when it comes to writing the right word, here are the rules to help you bear the struggle. Affect means to influence or to produce a change in something. The tornado affected citizens within forty miles of Topeka. The medicine will affect your eyesight for at least an hour. Winning the swimming medal affected Tina’s performance in school, too. Here’s a tip: Here’s a mnemonic: A is for action. Verbs are about action. Affect starts with an A, so it’s a verb. Presto. Gravity affects everything in the universe, but the amount of gravity affecting an object depends on two things: the masses of the objects being attracted and the distance between the objects. To avoid ecological issues, scientists and governing agencies consider how sustainable development affects the environment and its place in deciding future environmental issues. And we could do nothing to help them; Dunham was crying quietly beside me, and all the men were affected by the piteous cries. Note that in that last example, the men are “affected” because they are changed by the disturbing events of war, but that this change has an emotional factor, too. When a person is affected by an event, that often means that the effect is mainly on the level of emotion or psychology. More on that in the exceptions section. Effect is a noun, and it means the result of a change. So, if an event affects your life, you will feel the event’s effect. The effect of the tornado was devastating. You’ll feel the effect of the medication in the next twenty minutes. Tina’s big win had an effect on her confidence level overall. Here’s a tip: Think of the common phrase cause and effect. Cause ends with an E, and effect begins with an E. So not only does a cause lead to an effect, but also cause’s E leads to effect’s E, giving you a handy noun bridge to step across and remember which spelling to use. Climate change may actually benefit some plants by lengthening growing seasons and increasing carbon dioxide. Yet other effects of a warmer world, such as more pests, droughts, and flooding, will be less benign. With this measure, Lincoln effectively isolated the Confederacy and killed the institution that was at the root of sectional differences. And the bell had the effect of releasing us all from the paralyzing tension we had just survived—but only for an instant. The most common side effects of antibiotics affect the digestive system. In sum: keep your eyes on the prize. In this case, the prize is the first letter of each word. 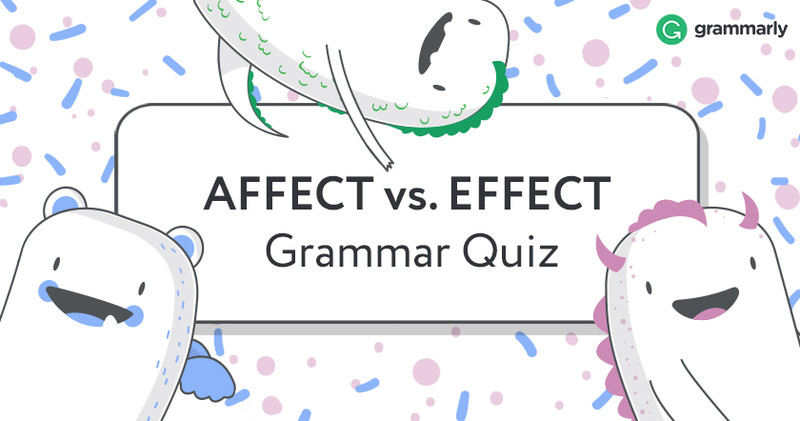 Don’t forget: “Affect” starts with A for Action—meaning it’s a verb—and with “Effect,” you can jump straight from “Cause” to “Effect” over that convenient E.
If you get that letter trick memorized, it should affect your spelling of these words immediately. In other words, make sure you spell them correctly. Now that you’ve mastered the basic difference—effect as a noun and affect as a verb—it’s time to shake things up. In some contexts, effect is a verb and affect is a noun. Thanks a lot, English. In other words, they wanted to bring about the effect of change—maybe by getting the government to change its policies or even step down. If you use affect here, it would mean “to have an effect on change” or “to impact change.” Protesters who want to “affect change” would be trying to impact existing changes. That’s nice, but not as powerful as creating change, especially when there’s a corrupt government on the line. What once seemed like a trivial way to keep in touch with friends, sharing photos and jokes, has become a force for societal change, […] empowering citizens of the world to unite and effect change in a number of ways. If this discussion about social media had to do with citizens trying to “affect change,” that would probably mean that they’re trying to speed up, slow down, or totally stop all forms of change that have to do with social media. Ironically, it might be easier to effect change with a really powerful Facebook movement than to affect the changes that are happening to society because of the widespread use of social media. Funny how that works, right? Affect as a noun means feeling, emotion, or specific emotional response. Sounds like the patient was in kind of a blah mood. Not too complicated (except maybe for the patient). Understanding more about the primary innate affects and the plasticity of the brain has important clinical implications. Say what? This is a great example of complex psychological jargon you might find in a psychology clinic or journal (like, for example, Psychology Today). It’s great if you’re studying basic feelings and brain activity—which is what this sentence is about—but if not, you’re probably safe with the knowledge that “affects” means “feelings” here. If you think that’s a bit complicated, no hard affects. That is, no hard feelings. You probably don’t have to worry about this one too much unless you’re in the field of psychology. But now if you come across a line about a graduation speaker having a huge affect on her audience, you can piece together whether the writer misspelled “effect” or the entire graduating class was moved to tears. Well, this one comes out of left field. But affected can indeed be used as an adjective to mean pretentious, artificial, or designed to impress. It usually isn’t a compliment, and means that someone is acting stuck-up or trying to look like they’re more important than they actually are. Note that when someone acts affected, it looks very different from when people are affected by something on an emotional level, like the soldiers above. See what the regent did there? His scratch is “affected” because this guy clearly knows he is not incompetent. In fact, he is very competent. He may even think he’s the most competent person around. Think of it this way: the regent’s behavior is affected by his own arrogance and sense of superiority. What kind of effect do you think that has on the people around this guy? Use “affect” as the verb in a sentence when you’re talking about producing change or making a difference. For example, a new discovery can affect a scientific theory, and failing a test can affect someone’s mood. “Effect” is a noun, and it is the outcome of an event or situation that created a change. The effect of the change can be big or small, but the fact that something changed is what makes the noun form of effect so important. For example, you can feel the effects of a cold or an earthquake, and the sun coming out can have a positive effect on your mood. Some synonyms of effect include words like result, repercussion, consequence, outcome, aftermath, and the noun version of impact. Let’s test how effective this explanation was! Test your understanding of affect and effect with our short and fun quiz. Keep track of your mistakes and comment on any questions that come up. Do you need more details? There’s no more effective way to get to know a word than to see it in print. What makes these two little words extra tricky is that they sound pretty much identical. Yes, that’s the homophone thing we mentioned earlier. For the most part, people will pronounce affect and effect almost exactly the same. But, every once in awhile, they won’t. If you listen closely, in some cases you’ll be able to hear a slight difference in the first syllable of the two different words. So, “effect” has a slightly stronger “eh” sound, like in “red,” while affect is pronounced a bit more lazily, as “uh-ffect.” But don’t count on those slight differences to tell one word from the other. Only a very careful enunciator will make the distinction at all, and it’s a very subtle distinction, anyway. There’s a whole scholarly field called affect studies, which studies affect—the emotional kind. You can even read all about how emotion is a big, academic deal in The Affect Theory Reader. Personal effects is an idiom: in this case, effects essentially means belongings. Chances are, your belongings have had some effect on your wallet, closet space, or personal life. Hence, personal effects. Effective means successful in bringing about a desired result. Affective means producing affect, in the emotional sense. If The Affect Theory Reader affects how you feel about affect, that would make it an affective book. So, if this article was affective, you were emotionally moved by learning the difference between affect and effect. If it was effective, you’ll use those words correctly from now on. It’s pretty much a win-win situation.